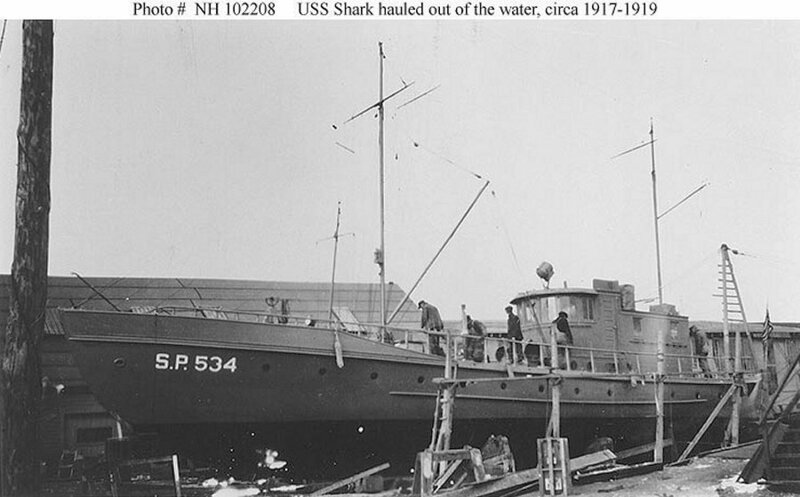 Motorboat: Built in 1907 as Ildico IV at South Yarmouth, MA; Renamed Shark; Acquired by the Navy 17 May 1917; Commissioned USS Shark (SP 534), 24 May 1917; Struck from the Navy list 16 September 1919; Sold 20 October 1919. Fate unknown. Specifications: Displacement 30 t.; Length 74' 4"; Beam 12' 5"; Draft 4' 2"; Speed 12 kts. ; Complement 12; Armament one 1-pounder and one machine gun. 86k Hauled out of the water, circa 1917-1919.